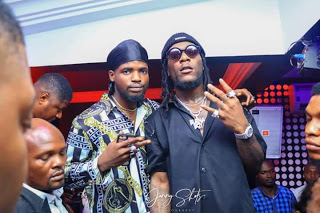 Port-harcourt based afro pop music group the Ajebo Hustlers has been unprofessionally begging pop sensation burnaboy to do a music collabo with them recently! The music duo which comprise of Piego and Knowledge met the Gbona" crooner at the boss lounge in Port-harcourt some few days ago,where Knowledge was pictured begging Burnaboy for a Collabo. It was however Understood that Burnaboy declined the request due to some stringent reasons. Knowledge AH has since gone on twitter to continue his begging game by requesting for retweets to get attention from Burnaboy. Burnaboy who is more active on instagram than twitter is yet to respond to the tweet! 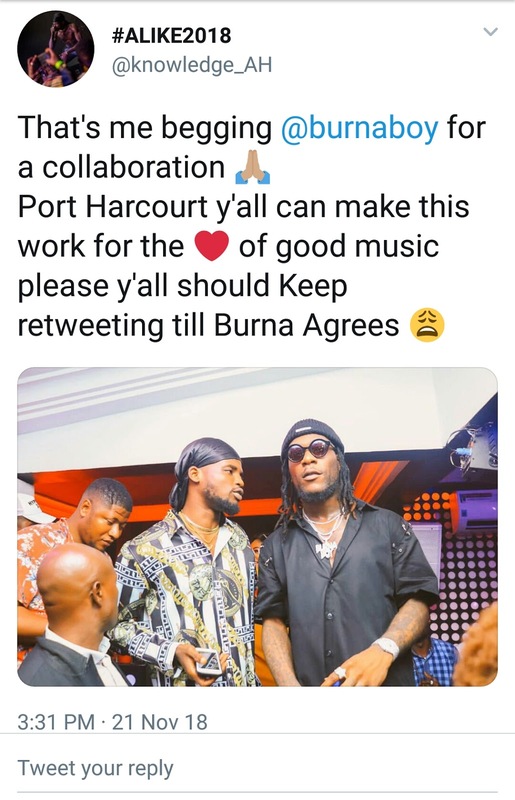 I personally think it is very uproffessional for one of the biggest music artists in port-harcourt to be begging for a collabo at this stage of their career. Burnaboy who is himself a port-harcourt boy has never hidden his non challant atittude towards his city as he has refused to host any music concert in the city for his thousand of his fans who has continued to support one of their own. He has also refused to support or promote any music act from the city of Port-harcourt. Instead he has continually tried to undermine the music industry in port-harcourt as his alleged physical attack on another port-harcourt music artist Mr.2kay has proved! Burnaboy is yet to make public why he has refused to show love to the city that made him!